The suspect was unshaven, about 5 feet 8 to 5 feet 10 inches tall, with grey hair and a thin build. 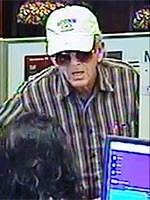 He wore a tan baseball hat, dark sunglasses, a black and white plaid long-sleeved shirt, blue jeans and black tennis shoes. After the teller provided the suspect with an undisclosed amount of money, he was last seen exiting the bank on foot toward an adjacent shopping center parking lot to the north, said Sgt. Michael Bloomsberg with the San Diego Sheriff’s Department. If you have any information on this crime, call the FBI at (858) 320-1800 (option 2) or Crime Stoppers at (888) 580-8477 with information and you will remain anonymous. You may be eligible for up to a $1,000 reward for information leading to a felony arrest.